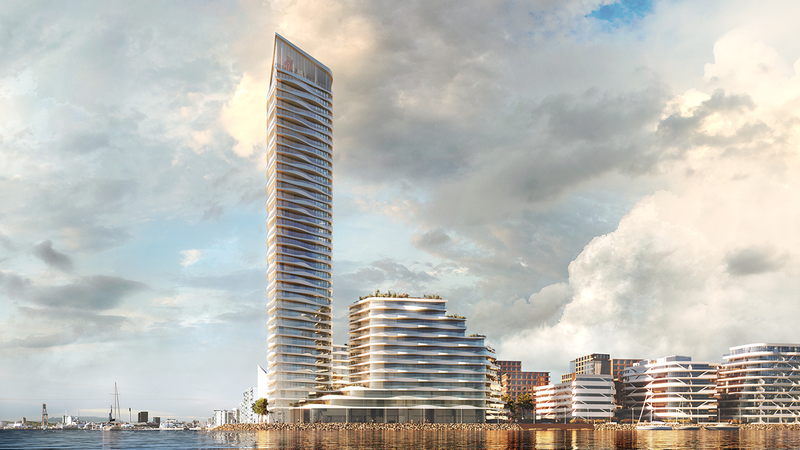 The team behind the planned 44-storey residential tower along the harbour in Aarhus, Denmark, has been revealed after receiving approval on the sale of the land from the Aarhus City Council. The new tower will sit beside the existing Lighthouse development which consist of 2 low-rise buildings, 8 and 10-storeys high respectively. Designed by local renowned architects 3XN, Lighthouse phase 1 was completed in 2012. Phase 2, consisting of the high-rise residential building, will begin this year with the target to complete in 2021. Ramboll's global high-rise division will be providing full engineering discipline and design management for the Lighthouse tower. The design and contractor team unlocked the scheme using detailed numerical finite element modelling of the local ground conditions which are a challenge for large concentrated loads as anticipated from the tower. With this deep understanding of the ground conditions the team proposed a foundation solution to manage the settlements which enabled an additional 4 floors on the tower to the delight of NorCap, the development group. The team is also employing traditional in-situ reinforced concrete construction a departure from Denmark’s heritage of pre-cast concrete. “We worked closely with Aarsleff and went back to a classic RC flat slab scheme for Lighthouse. The analysis showed that this approach would yield a shorter build time and lighter super-structure,” says Flemming Skov, Structural Discipline leader at Ramboll. “We have been very satisfied with the cooperation with Ramboll who has been onboard from the beginning. And now we are looking forward to adding 3XN to the mix,” says Ulrik Therkilsen, Head of Sales for Buildings West, Aarsleff. “We are using most of Aarsleff’s competences and when we add Ramboll’s high-rise expertise plus 3XN’s innovative architects, we can create something that is much greater than we would be able to do alone. Our cooperation has been one of ownership, entrepreneurial spirit and respect for each other’s competences, we have been united by the goal of developing the best economical solution for the project and the owner,” says Ulrik Therkilsen, Head of Sales for Buildings West, Aarsleff. The tower is envisioned to be Denmark’s tallest residential building. The new tower will consist over 200 homes, including F&B facilities and an observation deck located at the top of the building. The building is designed to receive sunlight from the South, especially during winter, and unobstructive views of the harbour. The entire design development was driven by the the district masterplan coupled with social development studies and cultural trends. The intent was to bring people together, including visitors of the harbour. Ample open spaces have been incorporated in the design to cultivate both housing and urban activities on the theme “Water, land and air”. The façade is inspired by the reflective lights in the surrounding water. It does not only contribute aesthetically but forms the exterior element of the building which includes balconies that are curved and changes in shape on every level. The exterior element was designed to be as light as possible and clipped to the main structure in order to reduce the overall weight to achieve building optimisation. Due to the reduction in overall weight, the design team managed to increase the building 4 storeys higher, with no added weight. Keeping in line with the aim to name Scandinavia a centre for iconic architecture, the Lighthouse is built amongst other Danish stand-out developments along the harbour such as the Isbjerget and Havneholmen. The Lighthouse tower project will run over the next 3 years and completion is expected in 2020.